As happened in Italy in Ancona in the same day in France in Rennes the same championships were held U20 and U23. 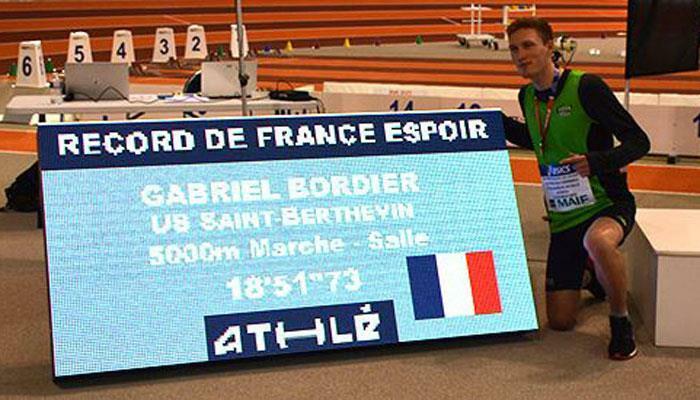 Victory for Gabriel Bordier (FRA) in 18:51.73 with a new record U23 of France (previous of 19:09.44 established in Nantes, FRA on Jan. 5, 2019). Bordier remained alone at the head of the race from start to finish and improved his personal best of almost 20". With this performance the transalpine, coached by Gérard Lelièvre and Gilbert Belin gets even closer (it was always in second place in the world ranking 2019) to Vasily Mizinov (RUS) who leads the world list in 18:54.5. Victory of Clemence Beretta (FRA) in 12:51.65, new national record in the U23 category, which becomes the main contender for the national record of Emilie Tissot of 12:41.56 which dates back to 2014. This performance also puts the French athlete in the second position of the world indoor list of the year. She also improves the personal outdoor record on the same distance (12:56.41). Third place to Loanie Cellard (FRA) in 13:42.13. Victory for Matteo Duc (FRA) in 21:30.85. At this point, the next U20 meeting between Italy and France will take place at Ancona on 2.3.2019 which sees candidates for the victory of Matteo Duc (FRA) and Riccardo Orsoni (ITA). We do not know if in this race we will have the pleasure to see the very interesting match at the next U20 meeting Italy and France between Camille Mutard (FRA) and Andrada Lavinia Lacatus (ITA) waiting for the Italian passport.